After years of trying to responsibly resolve the headache of readymix wastage and returns, AfriSam’s Jukskei Quarry in Midrand has made a breakthrough that will see this unsightly and potentially problematic material reused in its G5 sub-base product for road-building. 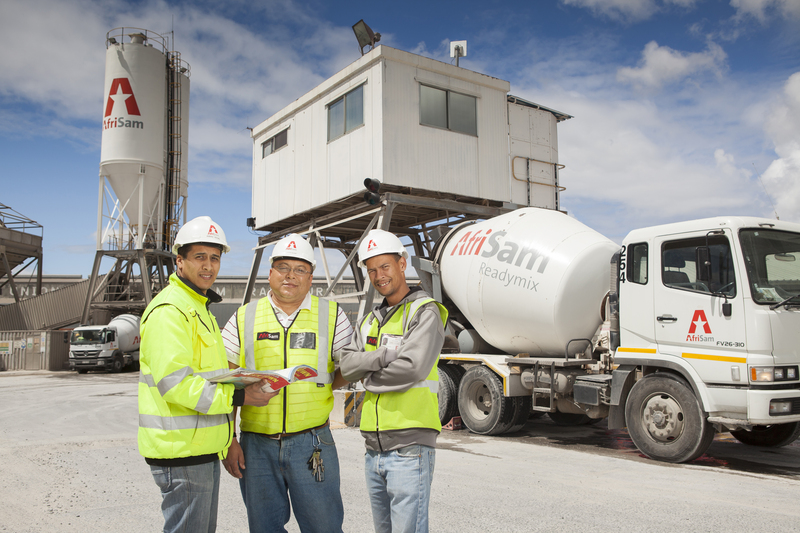 According to Mohamed Docrat, production superintendent at AfriSam’s Jukskei Quarry, it is “in the nature of the game” that unused concrete will be returned to their on-site readymix facility on those occasions when customers over-order or when there are other factors that prevent the customer from taking full delivery. He says that a number of solutions have been tried over the years – some more successful than others – including the filling of mined out areas, the creation of roadways and block making for separation barriers in the quarry. Many of these ideas worked quite well in terms of the purpose for which they were designed, but they all came with associated, and sometimes unpredictable, costs. The solution focused on the idea of adding the recycled concrete to the quarry’s G5 product, as this was a product category that was permitted to contain material from multiple sources (unlike products within the G1 classification, which were single-source only). Indeed, the process of breaking up the returned concrete generates plenty of fines, says Docrat, which is beneficial to the product as the class specification for G5 demands that it must comprise about 80% fines. It was decided that returned material would mainly be dumped in a specified area at Jukskei Quarry some distance away from the main quarry site. The plant operators, as well as the load-haul operators, play an important role in checking that the material is within specification. For instance, the load-haul operators must be selective in what they bring to the stockpile, so that it can be blended in the appropriate quantities before crushing. The blended material is then fed into a jaw crusher, after which the crushed material goes onto a production stockpile. Here, a loader operator again blends, or homogenises, the material before it is taken by dump truck to a set-back stockpile, where it is ready for sale. The first trial was on the Gauteng Freeway Improvement Project’s N1 extension, where AfriSam provided G5 for a few runs and the contractor gave it the thumbs-up; that was where the success of the idea really started to prove itself, according to Docrat. As with all AfriSam products, quality control and rigourous testing is constantly required to ensure that it is fit-for-purpose. The material is sampled first from the production stockpile. Then, once it is in the set-back stockpile, it is fully tested for compliance with the final specification for G5 product. Another successful application for the returned concrete at AfriSam’s Jukskei Quarry has been the paving of many parts of the readymix site. A concerted effort is underway at the quarry’s readymix division, where a new plant is in place, to construct pedestrian walkways and to pave open areas. This is likely to consume a portion of the returned concrete. This process begins with the preparation of areas to be paved, so that wet concrete can be poured into the waiting formwork and immediately leveled, with expansion joints left between the slabs. It is a well-organised process that ensures an attractive and functional end-result, he says. Docrat highlights the importance of an environmentally friendly response to the issue of returned concrete, as there are no dumping facilities which accept this kind or quantity of waste. Recycling also means no slush around the plant, less potential for contamination, and a smaller carbon footprint. “Our Environmental Management Programme requires that we achieve a certain level of recycling in our waste management strategies, and this breakthrough in recycling concrete is certainly a contribution to our performance in this regard,” he says. The actual amount of concrete recycled each month is dependent on sales, which vary according to the economic climate and times of year. But he is confident that the amount of returned concrete that will be recycled into saleable AfriSam product could comprise up to 60% of the total concrete returned to the readymix site. The recycling process, he says, will certainly make for a more sustainable environment; while at the same time make a contribution toward offsetting the costs that returned concrete place on the business.